ISHAKA – South of Ishaka in Bushenyi District and in the new Sheema District lies a breathtaking view of panoramic hills, valleys and green vegetation. The word Kitagata in Runyakitara means a warm and good place. At the foot of these hills is the Kitagata Hot Springs, a popular healing site in Uganda that is turning into a tourist attraction. Those who have experienced this magnificent work of nature recommend others to visit. Kitagata Hot Springs connects to Queen Elizabeth National Park, Bwindi Forest and Lake Mburo National Parks. 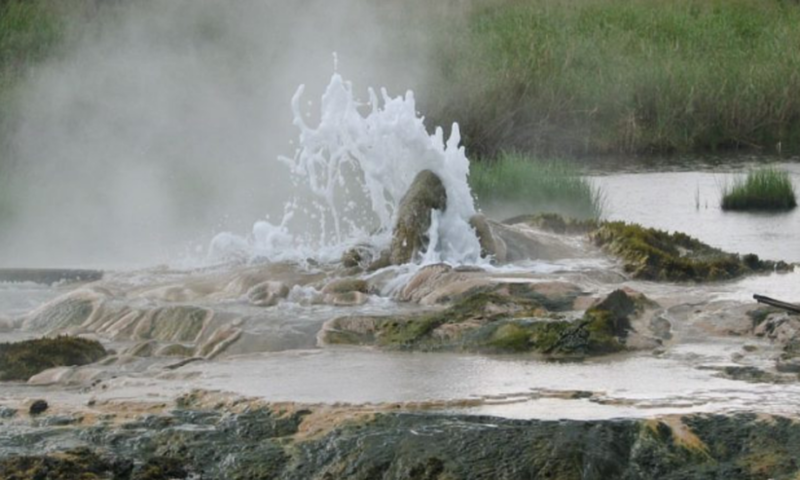 Kitagata hot springs are located on the Ishaka-Kagamba, in Sheema County, in Sheema District Western Uganda, approximately 2 km (1.2mi), by road, southeast of the town of Kitagata, one of the urban centres in the district. It is 62km (39 miles), by road to the West of Mbarara, city. The path to the springs goes through a patch of rainforest where red-tailed monkeys, grey-cheeked mangabey, black and white colobus are common. For those that love bird watching, the different bird species like forest horn will guarantee you great satisfaction. Hundreds of people go to Kitagata to receive healing from the hot springs. Half-dressed men and women bathe in the warm waters which they believe possess healing powers. The patients are divided into two sections; the females and children and the males. The spring where females bathe is nearer while the one used by males is more distant. Patients from far and near flock the springs to soak themselves in while some drink the water, in a bid to seek healing. Naturally, the communities living near the hot springs have both spiritual and superstitious attachments to them. The female spring, for example, is visited by women who hope to be cured of infertility. The Kitagata water is rich in sulphur, sodium chloride lithium sulphate, calcium, magnesium as a result of the cracks that form in the earth’s crust where they extend to the hot earth, depositing the minerals in the water. All those minerals have medicinal value, which could explain the healings at Kitagata. The evenings at the site are usually a hub of excitement that one could easily misunderstand it for either a marketplace, a clan meeting or some sort of celebration, as there is an immense crowd gathered here all the time. Many stories have been told about the Kitagata Hot Springs, but the most popular belief is that it has healing powers. There are two hot springs adjacent to each other. According to the locals, one of the springs is known as Ekyomugabe, because it was used by only the king (Omugabe) of Ankole. The other, named after Uganda’s National Referral Hospital Mulago, is used by everyone else and is believed to have more healing powers. The water here heats up to 80 degrees Celsius. One section of the hot springs is hot enough to cook porridge or boil eggs, while the other side is warm. It is the hotter springs that are believed to cure diseases like ringworms. From a distance, one will see half-naked people sitting on rocks to relax and dry up after enjoying a birth from one of Uganda’s gifts of nature. The road to the springs is murram and goes through a large swamp, rendering the scenery to the site such a breathtaking site with narrowed hills and inselbergs characterised by beautiful green vegetation. It is the River Ngaromwenda that supplies water to Kitagata. During the rainy season, River Ngaromwenda floods thereby making the Kitagata hot springs rather warm as opposed to hot. At such times the usual number of 800 visitors per a week may sag a bit, but Kitagata hot springs are still a hot tourist attraction.